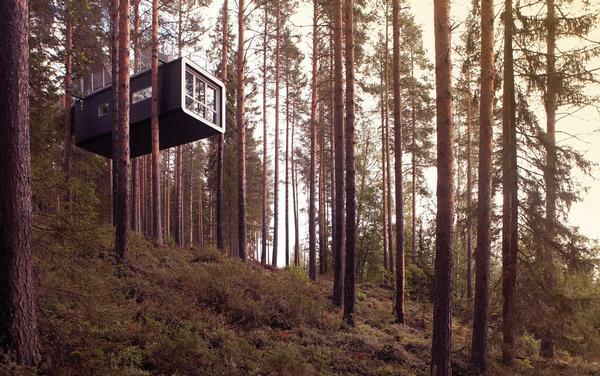 The 7th Room joins six other guest suites, all contained within treehouses, that make up the Treehotel in Edeforsvägen, Sweden. 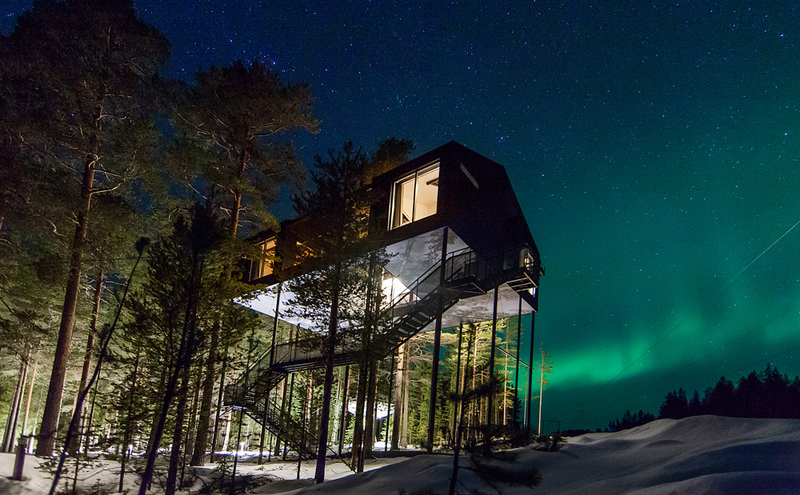 The 7th Room was designed by Norwegian architecture studio Snøhetta, providing a unique perspective of the Northern Lights from a forest canopy. 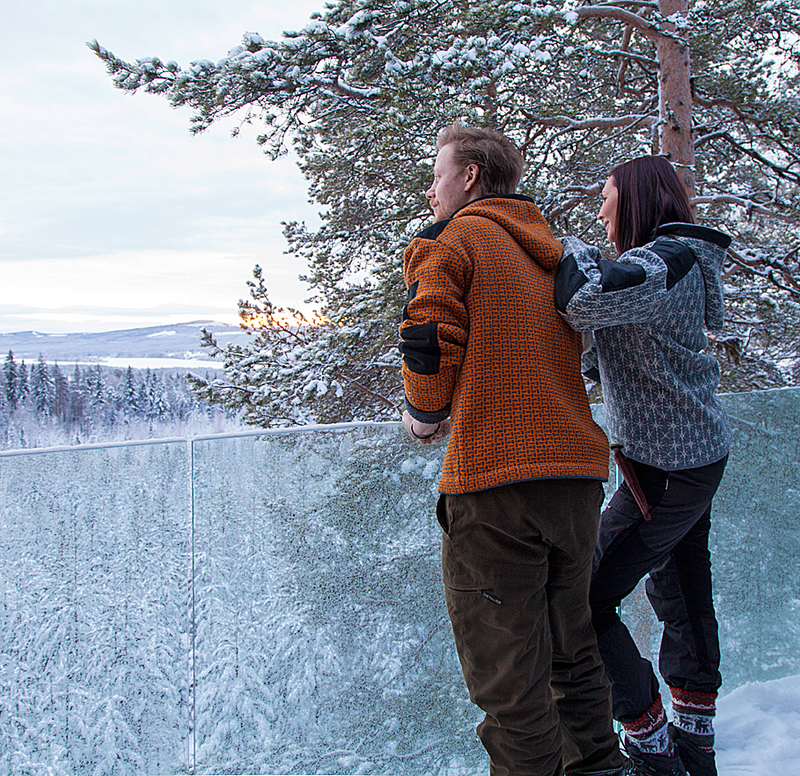 Hovering 10 metres above the ground amongst the trees, the 7th Room is a traditional Nordic wooden cabin with a large netted terrace suspended above the forest floor. The unusual hotel room is supported by 12 columns, and a large pine tree extends through its central void. 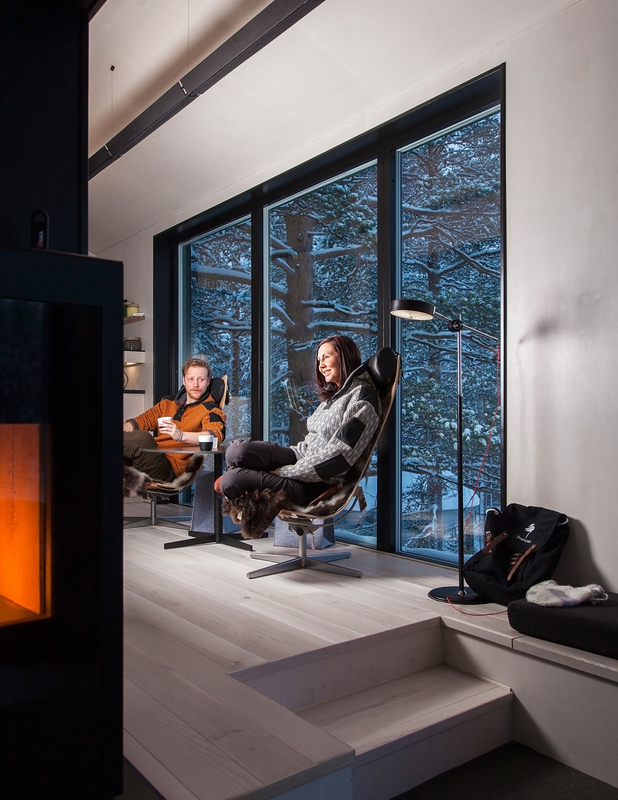 Up to five visitors can live in the space, which has a social lounge area, a bathroom, two bedrooms with beds embedded in the floor and an outdoor terrace – where guests can sleep under the stars in a sleeping bag. 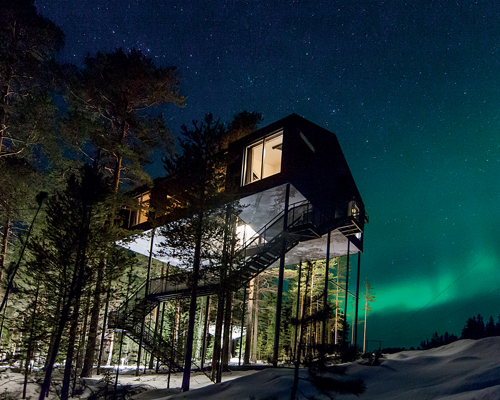 Previous Treehotel suite architects have been Mårten Cyrén, Inrednings Gruppen, Rintala Eggertsson Architects, Tham & Videgård Arkitekter and Sandell Sandberg. 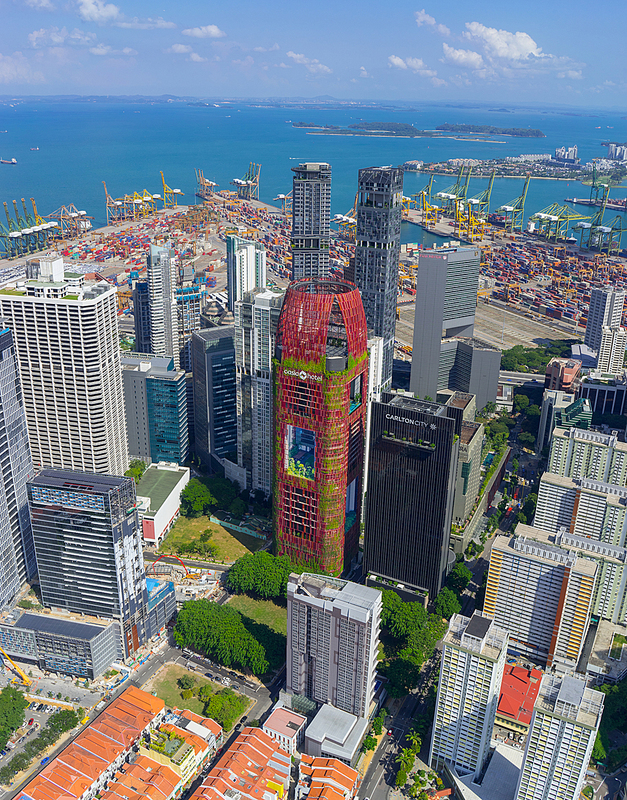 Singapore-based WOHA is famous for its garden hotel, Parkroyal at Pickering, and followed its success in the city’s central business district. 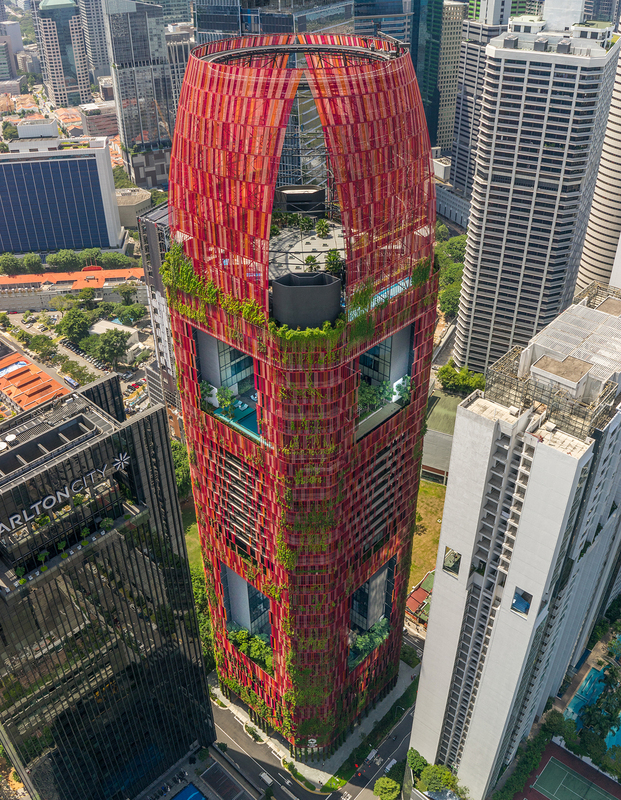 Launched in 2016, Oasia Hotel Downtown is covered in a permeable aluminium façade, allowing creeper plants to take hold of the red structure and grow and thrive, over time transforming the building into a towering green ecosystem. The façade is made up of 21 species of creepers to make sure it’s lush and resilient during different weather conditions. A further 33 species of plants and trees are used throughout the hotel, becoming a haven for birds and animals in the city. 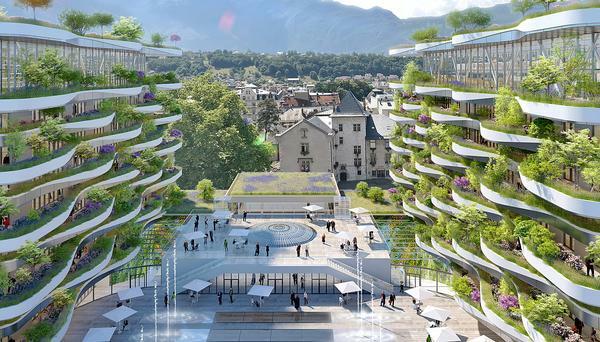 An eco-luxury hotel and adjacent next-generation youth hostel are under development in Paris, in the Rive Gauche district, which aims to become a bastion of sustainable architecture in the city. 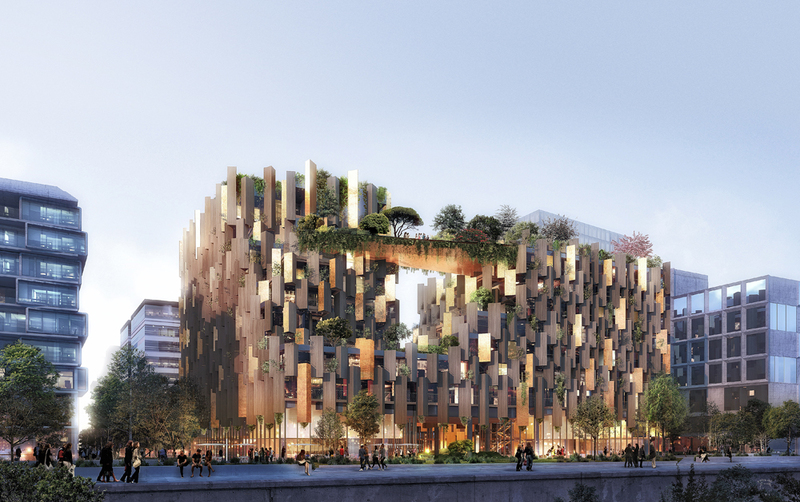 Kengo Kuma has designed 1 Hotel, embedded within planted terraces and suspended gardens at various levels to “create a green lung for the city”. The complex will include a sports centre, bar and restaurant, business zone and co-working space, as well as a public garden that will complement the nearby garden of the National Library. The related hostel, Slo Living, was designed by Marchi Architects. Hoi An’s old town has experienced rapid growth and an increase in tourists since it was named a UNESCO World Heritage Site. The area is famous for its traditional architecture, featuring tiled roofs and small courtyards. The nearby Atlas Hotel is a new development that seeks to capture the charm and tranquility of old Hoi An and the dynamic emerging Hoi An. 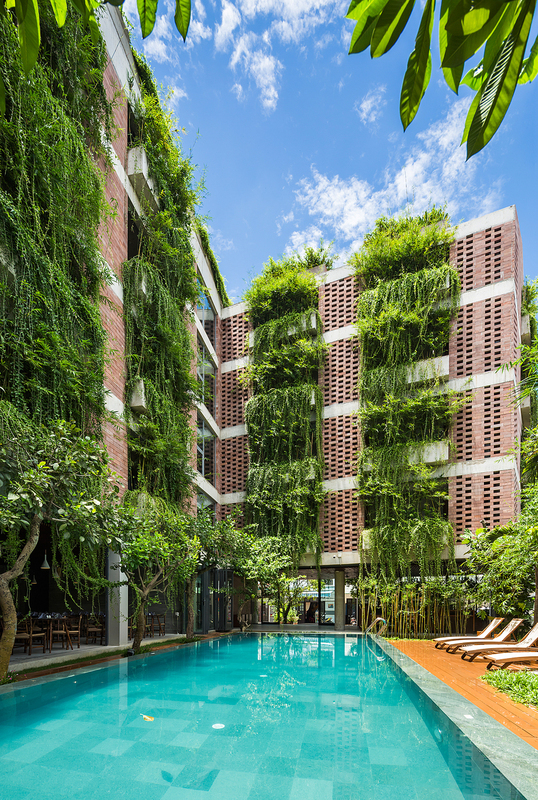 The five-storey, 48-room Atlas Hotel has many internal courtyards and deep planters which make up the hotel facade, allowing greenery to provide the rooms with solar shading, while the perforated stone walls allow light and airflow through but keep the space cool. 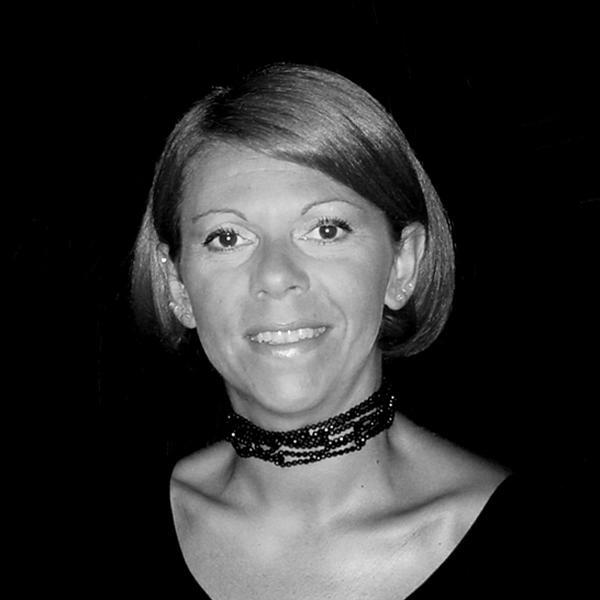 The hotel offers a restaurant, café, rooftop bar, spa, gym and swimming pool. 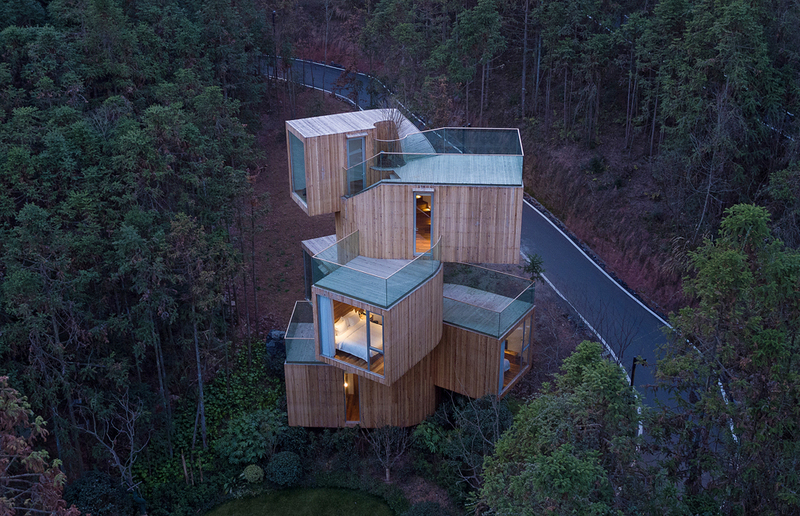 Stacked timber volumes form the structure of Qiyunshan Tree Hotel, a small accommodation in the heart of the Huangshan mountains in China’s Anhui province. Designed by Shanghai-based Bengo Studio, the hotel features two bedrooms, two bathrooms and a living room in its 120sqm space. 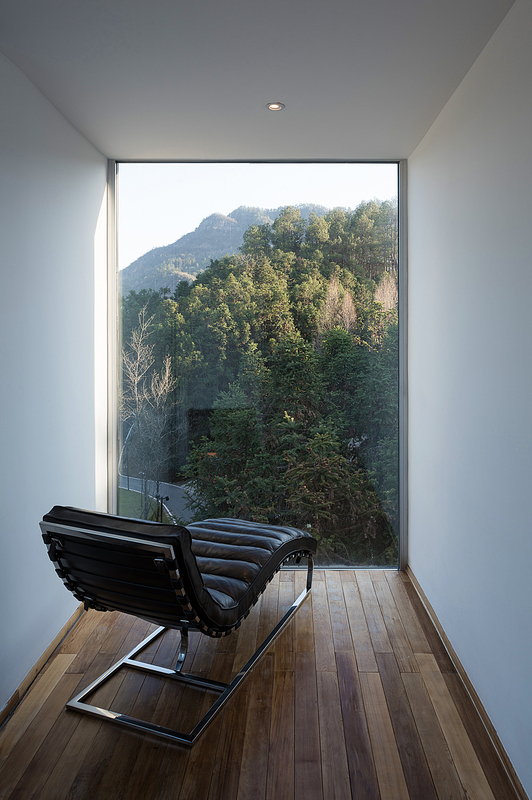 The top level is a ‘landscape room’ providing unobstructed views of the lush scenery. Reaching 11 metres high, the hotel is the same height as the surrounding red cedars. Italian architect Stefano Boeri has designed a tree-covered resort property in China’s Guizhou province. It’s part of Wanfeng Valley, a sustainable district that’s being developed across 20 hectares in Xingyi City, Qianxinan. The property is part of the Cachet Hotel Group and will be the centrepiece of Cachet Wanfeng Valley ‘lifestyle destination’ – its first resort development in Asia. The building will feature a 182-room Cachet Resort Hotel and a 71-room URBN hotel, two restaurants and lounges, a swimming pool and fully equipped fitness centre, as well as a Cachet cSPA – an environmental and design-led concept created by consultancy and management firm WTS. 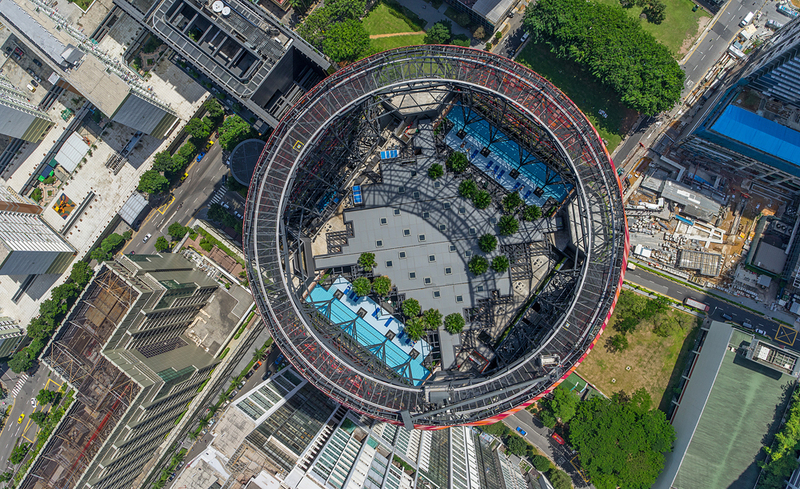 Rosewood Hotels & Resorts’ first project in South America, this São Paulo hotel has been designed by Jean Nouvel as a “vertical park”. 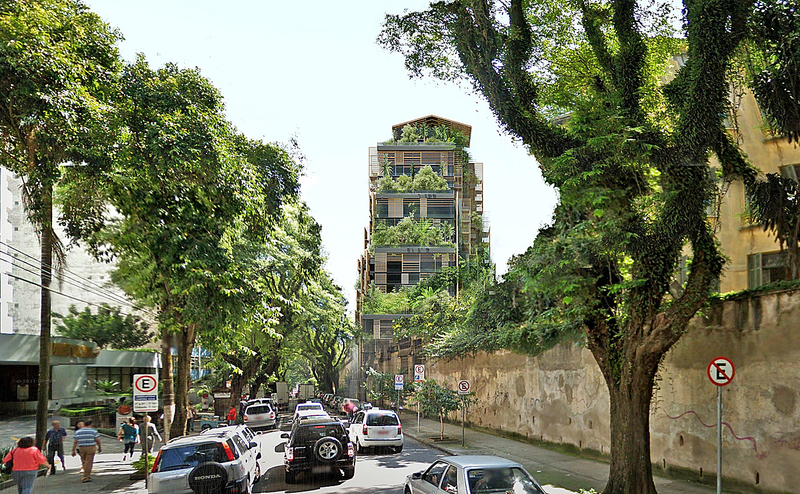 Located at a city building that was formerly a maternity hospital, a 90-metre tower with a latticed steel facade will rise next to the historic building, and will be covered with landscaped terraces. 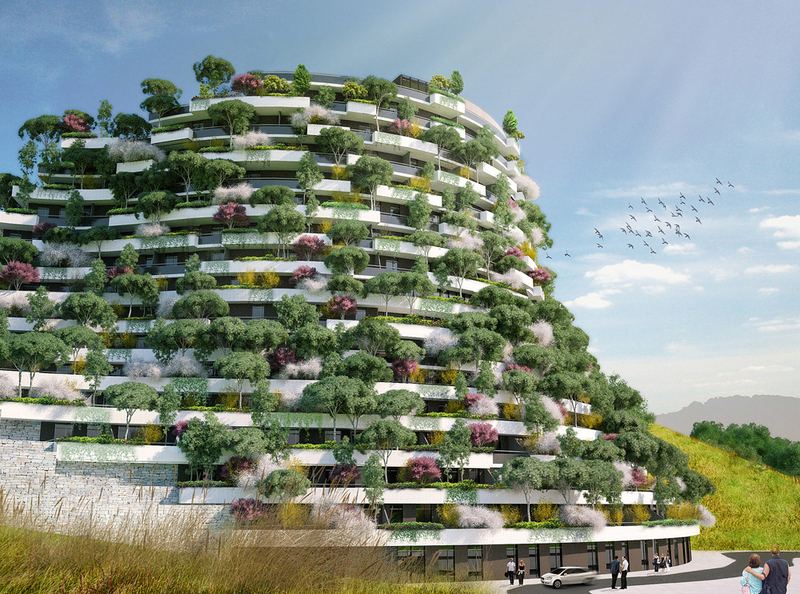 The plant- and tree-covered hotel will offer 151 guest rooms and 114 private residences, with interiors designed by Philippe Starck. 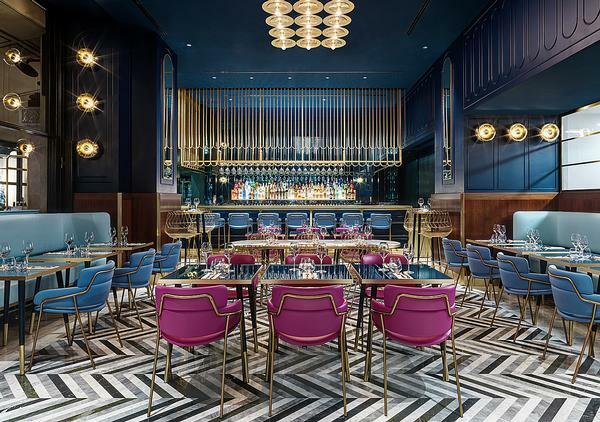 Two restaurants – one on a veranda overlooking the lush hotel gardens – a bar, a caviar lounge, a rooftop pool and another outdoor pool in the landscaped grounds, a large spa, fitness zone and luxury retail will all be available onsite. Eventually it will be covered in trees like those in the park, such as fig and magnolia trees.